A protected bicycle lane stretching seven blocks near the South Street Bridge will be constructed by the middle of next year, Philadelphia officials announced on Wednesday. Flexible delineator posts will be installed along an existing bike lane from 21st Street to 27th Street on South Street. They also will be installed along one block of 27th Street, between South and Lombard streets. The bike lanes also will be repainted. The project has been in the works for several months, with a community listening session drawing some 200 people in July. But the formal announcement came just two weeks after Emily C. Fredricks was killed while cycling in an unprotected bike lane on Spruce Street in Center City. Her death – the fourth biking fatality this year – prompted renewed calls for the city to install protected bike lanes and other safety measures throughout the city. Just one day after Fredricks, 24, died from injuries when struck by a trash truck, about 100 cyclists formed a human wall along the bike lane where she died. Several days later, the city repainted the bike lane – maintenance that activists said was months overdue. 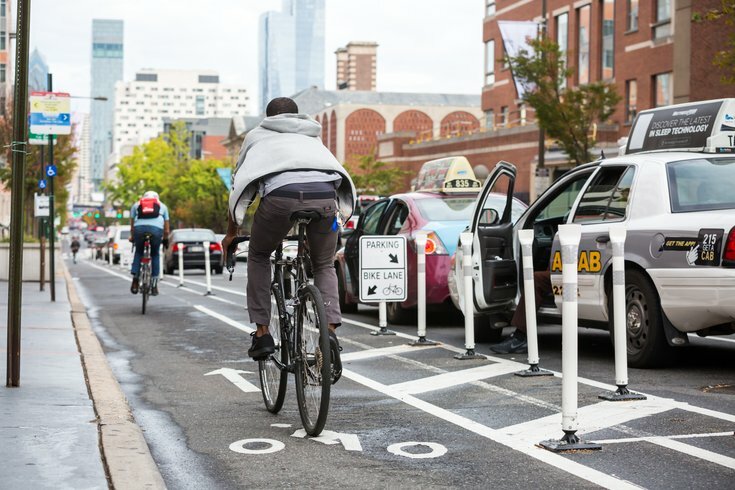 The Bicycle Coalition of Greater Philadelphia, an ardent supporter of protected bicycle lanes, praised the city's decision to install delineators along the blocks leading to the South Street Bridge. The bridge itself has unprotected bike lanes. 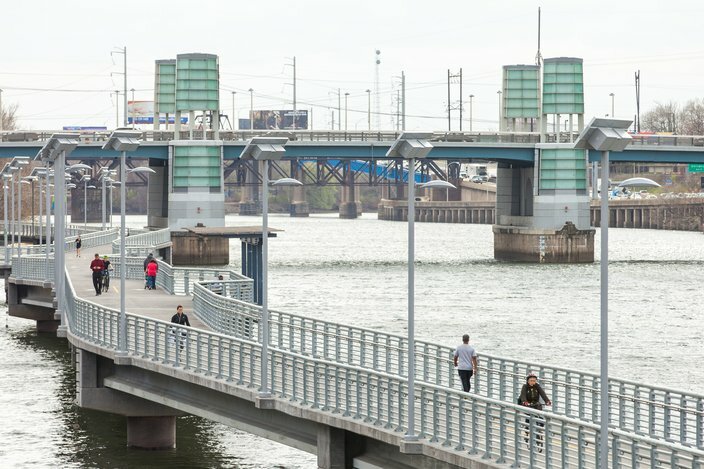 "The South Street Bridge is the most biked bridge in the state of Pennsylvania," spokesman Randy LoBasso said. "People are going to school. They are going to work. They are using the lanes on that bridge for a lot of different reasons. "We think that putting in this protection is only going to encourage more people to ride on there and create an added benefit for those who already do." Every day, nearly 1,000 cyclists cross the bridge in each direction, according to a count conducted in 2015. Kelley Yemen, the city's director of Complete Streets, called the protected lanes "particularly important" in the city's effort to upgrade its bicycle network. "Protected bicycle lanes will create a safe space for people of all ages to bicycle, eliminate loading and parking in the bicycle lane, and clearly separate bicycle space from vehicle space," Yemen said. The South Street Bridge, at rear, and the Schuylkill Banks Boardwalk. City officials began community outreach on the project last summer by holding a community listening session. At the time, the project also included the installation of delineator posts along a nearby stretch of Lombard Street. But that portion remains in limbo, due to the concerns of some residents. "While consideration of Lombard Street continues, we believe it is important to move forward with this limited project on South and 27th streets to improve safety for hundreds of bicyclists riding to or from the bridge," Deputy Managing Director Michael Carroll said in a statement. Mayor Jim Kenney has pledged to install 30 miles of protected bike lanes during his time in office. The city's first protected bike lane opened in September 2016 along a one-mile stretch of Ryan Avenue in the Mayfair section of Northeast Philadelphia. Another protected bicycle lane – running from 45th to 34th streets along Chestnut Street – was completed in late August. When Kenney took office in January 2016, Philly was the largest city without a protected bike lane. But cycling advocates say there is still a long way to go. "There are many bike lanes that can use protection – and protection would help keep cyclists much safer using those streets," LoBasso said. "As we saw recently, paint is just not enough." The Bicycle Coalition plans to meet with Councilman Kenyatta Johnson to discuss safety improvements for Lombard Street, LoBasso said. The coalition has proposed adding two loading zones on Lombard Street to relieve parking pressure on the existing bike lane. Other recommendations include changing curbside stopping regulations and using green paint to alert motorists where the lane commences. The protected bike lanes on South Street are being funded by a grant from the Department of Community and Economic Development Multimodal Transportation Fund. Supporters include the South of South neighbors Association, Center City Residents Association and the South Street West Business Association.